Green screen studio kits are used to superimpose a subject on a background. Green screens work by a cameraperson shooting a subject against the green background and then uploading the footage to a computer, where the green background is removed and replaced with a different background. 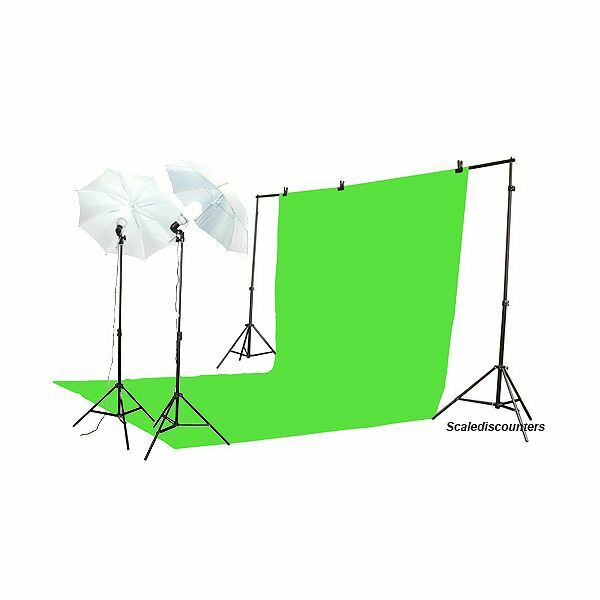 Green screens are available in all sorts of different sizes and materials. Finding or making the ideal green screen for your application is important so you can get the best results. The size of your green screen will be dictated by what you are shooting. I have a small screen about five by five feet, which works great for head shots, but is way too small for filming a whole person. If you are looking at shooting a person or another large object in front of the green screen, there is an easy way to determine how big you will need it to be. Set up your scene, or at least a trial run of it. Look through the viewfinder of your camera and see where the edges of the scene are. Your green screen should be larger than the scene itself. A tightly woven material such as muslin or canvas will serve you best, in terms of being easy to transport and store, but still tight enough to not let light pass through. The downside to fabrics is that they wrinkle and may need ironing to hang flat. Another excellent material is background paper. This comes on a roll and is probably ideal, in terms of being easy to use and not susceptible to creasing in the same way fabrics are. The negative part about paper is that it cannot be cleaned and reused, so it is a consumable product. In addition, if you buy a roll nine feet wide, it can be quite heavy and difficult to transport. Another option, if you want to create a permanent set-up, is green screen paint. Simply paint a wall the right color and be done with it. Background supports are support systems from which you hang your background. They can be simple or complex but all consist of the same basic idea. They are essentially rods supported by uprights. Professional grade background supports are nice because they use telescoping poles. My own background support is homemade, and although it is not as flexible as the professional models, it works just fine for me. You might also want to get some clamps to pull the fabric taut against the support, and thus eliminate wrinkles. Lighting the background is easy. Set up lights on either side, at about a 45 degree angle and send a good wash of light across the background. Professional lights are best but work lights from the hardware store are fine as well. Written from the author's experience using green screens in his home studio and a professional television studio. Green screen studio kit image by Stephen Heywood.